Is there any other feeling quite like crossing the finish line at your first marathon?? Not that I’ve ever experienced. I had hoped going in that I could finish under 4:15:00 for my first marathon, so I am thrilled that I beat that by several minutes! I would love to get myself to a sub-4 hour performance, but there is time for that, right? One thing at a time. I was definitely nervous going in, though those nerves didn’t really kick in until the night before. 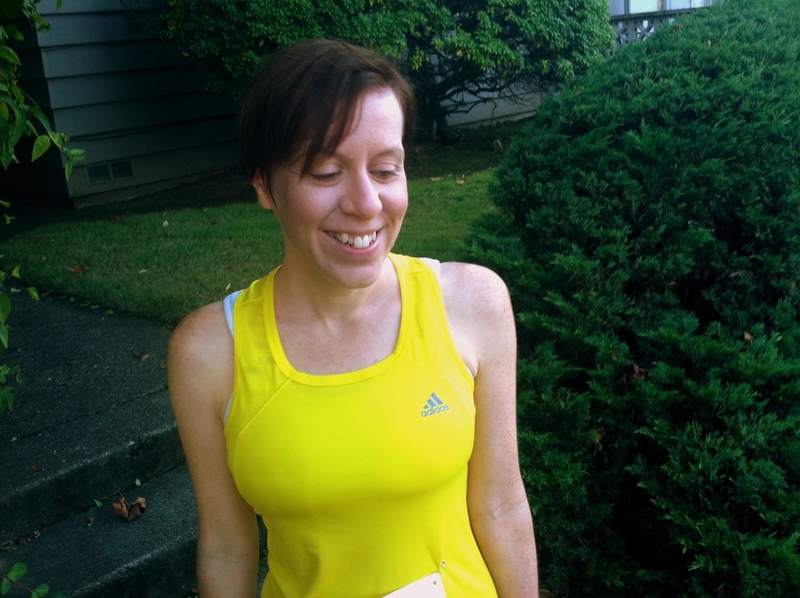 I actually did better then I had expected during my final taper week (though I still didn’t enjoy tapering one bit), but by the time I went to pick up my race packet the night before the marathon, I was all over the map. I was excited, anxious, doubtful and confident all at the same time (yes, that is possible). One thing that helped with my nerves was the fact that the race was really well organized. The packet pick-up was smooth; there was a shuttle the morning of the race that stopped at all the popular hotels, picking up runners and spectators to take them to the start line, and the race started promptly. All excellent things so kudos to the race director! The course was beautiful. Even for someone like me who is TERRIFIED of the ocean and deep water in general, it was gorgeous. We started out with the first few miles running through the city, then headed down by the ocean and along the bay. The views were definitely a plus – sparkling water to one side, lush trees to the other, with a smattering of homes, shops, and ocean-front businesses along the way. The locals were also amazing – many of whom set up outside their homes to cheer everyone on. To top it all off, the weather was pretty much PERFECT. After a week or more of cold, constant rain pounding the Pacific Northwest, all was well. The sun was out, the wind was calm, and temps were moderate. So, with all of that good energy, how could I not be set up for success, right? At the start, I was eager to go, but still a bit nervous. But, I settled into a rhythm that I carried pretty well for well over the first half of the race. I felt good. I felt loose and strong. I remember at one point, around mile 13, thinking: This is great! Maybe it won’t hurt after all! Oh, that’s funny to think about. Sometimes I’m just silly. Anyway, the majority of the way things were really solid and I was pleased with my pace. I certainly started to notice some pain, though, and realized the error of my earlier thinking. 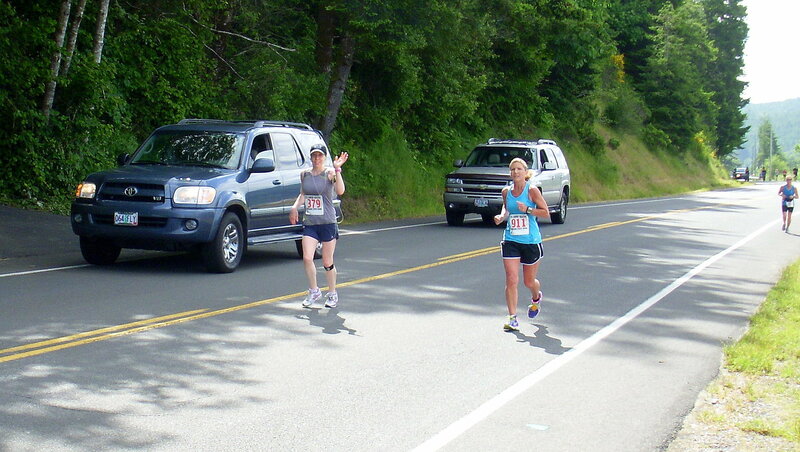 My left hip and lower back began to ache around mile 18 or so. 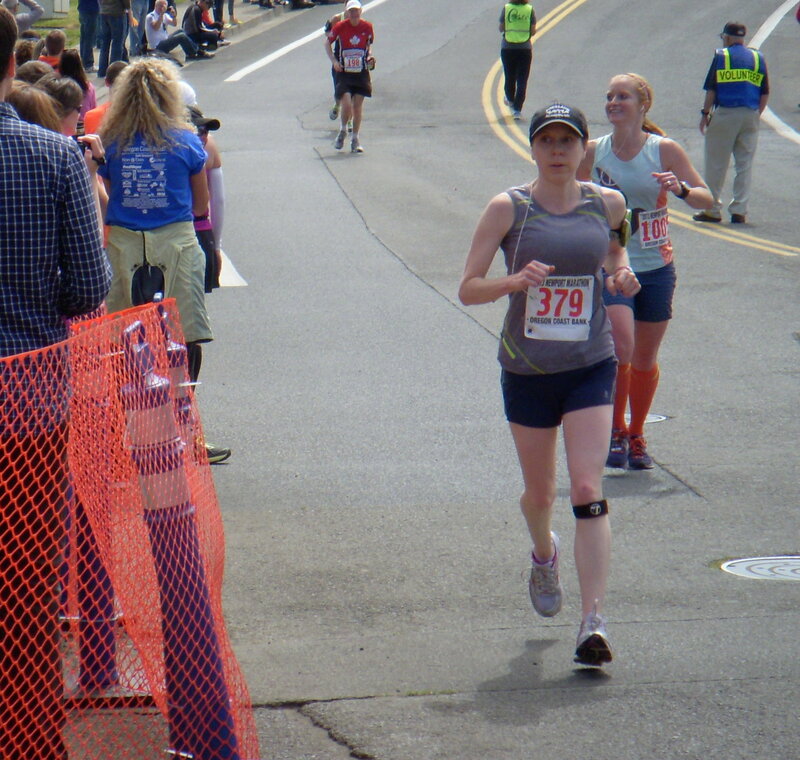 It grew steadily until the end of the race and during miles 22-25, I honestly was in quite a bit of discomfort. My pace slowed significantly (though I never once stopped running). At that point, though, it was close enough to the end where I could just focus on each individual mile. 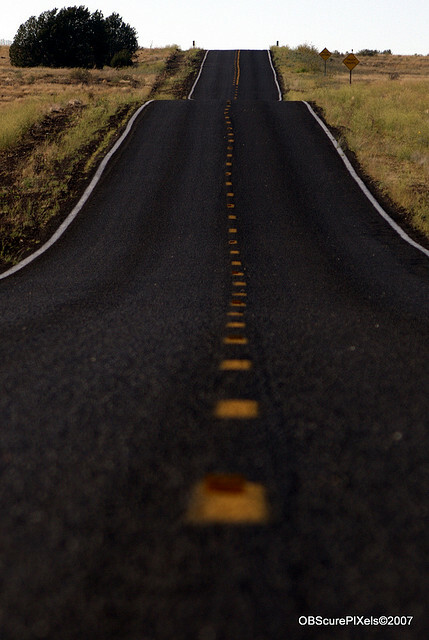 I celebrated every little blue mile marker I passed. 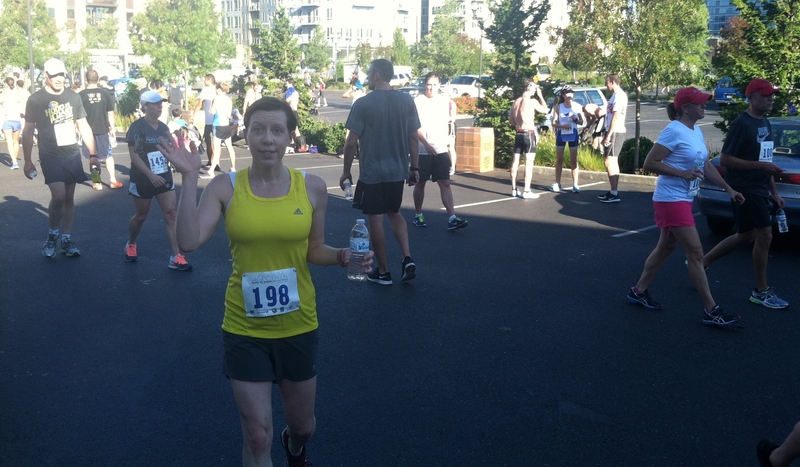 When I strode by mile 25, I was thrilled. That last 1.2 miles was actually pretty amazing. Knowing that I was that close to finishing, the pain I felt became irrelevant. I was able to pick back up my speed somewhat and finish with a surge. Finishing a race with a surge feels GREAT. 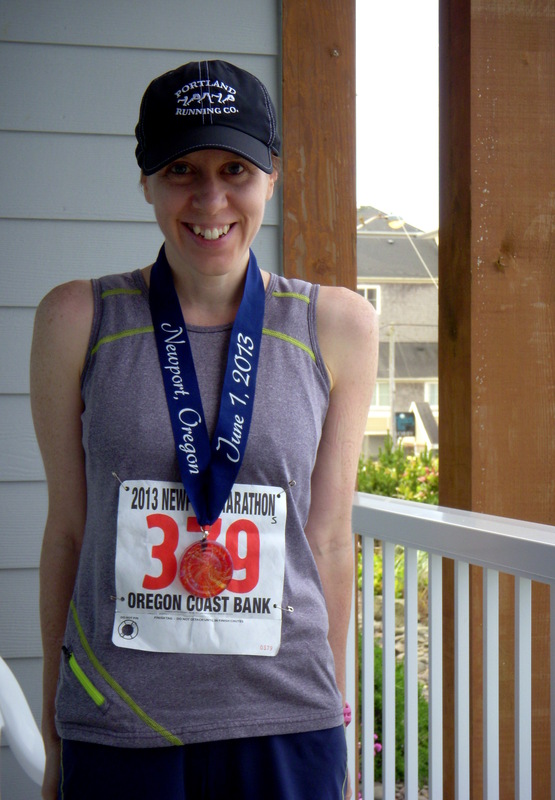 When I crossed the finish line I was certainly tired and sore, but I was also thrilled. I have some great moments in my life, don’t get me wrong, but the feeling of that moment is uniquely special to me. And it reminds me of how very important running has become to my life. I’m already thinking about my next races and my future marathons. I never doubted wanting to run the race or wanting to run the next one. I knew even in those moments of pain and fatigue that I was ready to do it again. Spring is here. Dare I say that? I hope I didn’t just jinx it back into hiding. Warmer weather and longer days lend themselves to encouraging people outdoors – to the trails, the track, the pavement. For those who are returning to the outdoors for the sake of running or for those considering a running routine for the first time, I offer you some tips on what you need to get started successfully. It’s been said time and time again that one of the wonderful things about running is that you don’t need much to do it. Put on some shoes and go! And, while this is technically true, a few additional items can help to increase overall performance and enjoyment – both essential to sticking with it. Please note that I’m not going to discuss shoes in this post, because of course you know you need shoes to run in (unless you’re going all-out barefoot and, in that case, there are lots of resources for how to do that safely). Plus, there are so many different types and styles specific to each individual runner. So, on the issue of shoes, I will just say this: seek out a running store, not a big box retail chain, if you can to buy shoes. You’ll get expert advice tailored to your needs by real runners and your money will be better spent. You can also check out one of many running shoe guides like this one here from Runner’s World. Ahhhhh. Wicking technology. It’s a glorious thing. To get out and run comfortably you’re going to need some proper running clothes and proper running clothes wick. You’re going to sweat, even in mild temperatures, and the last thing you will want is to feel that sweat trapped on your body as you’re striding along. So while cotton is great for everyday, it is a runner’s enemy (chafing and perspiration-soaked clothes are nobody’s friend). Look for items that have wicking technology, or at least include cotton as only a minor part of the overall material blend. A comfortable pair of running shorts or capri pants. Look for pairs with small pockets in them. You’re going to need a place to store a house key or other small items and a good pocket means you don’t have to worry about buying and wearing an additional item to do so. 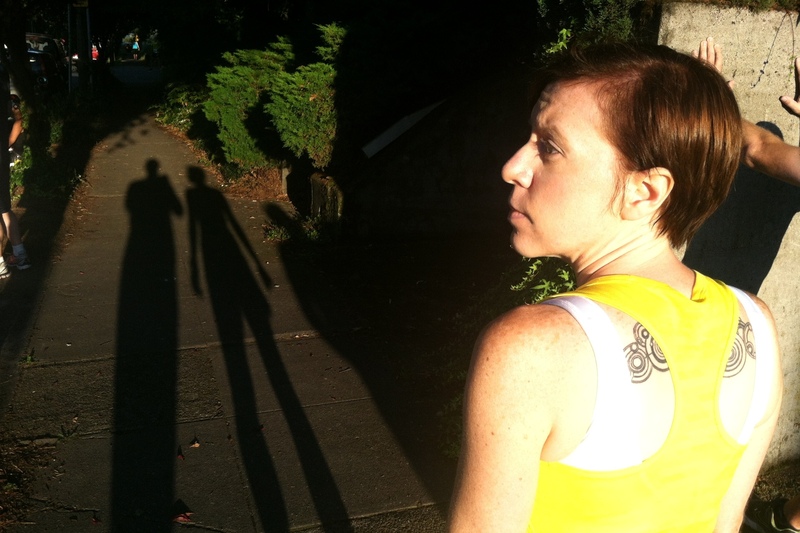 Oiselle brand for women is absolutely amazing. Materials, fit, and style are unsurpassed. I shared my love for them once before here. For women and men, I also like Brooks. Excellent quality and a brand that really focuses on knowing runners’ needs. Building a running wardrobe can be expensive at first, so if you’re on a tight budget check out Target for tops. Their lines may not be as durable as some of the other brands, but they’ll get you started. Also, I’ve had some success scouring racks at discount shops, like Marshall’s and TJ Maxx. They carry a surprising amount of Adidas, Nike, and other big name brands at deeply discounted prices. This one’s simple, really, but will make your life a lot easier. Not only does it allow you to head out for a run first thing in the morning without sharing your crazy bedhead with the rest of the world’s early risers, but it’s a great help in keeping both rain off your face and sun out of your eyes. I have both a warm skull cap and a breathable cap with bill. I switch them up depending on the weather and have even worn them together on really cold days. A lightweight, vented baseball-style cap is a good place to start. It will help rain roll off of your face on wet days and shield your eyes a bit from spring’s earliest rays of sunshine (without having to yet invest in pricey sunglasses). I often represent one of my local running stores (LYS) during my runs and wear a Brooks-made hat from Portland Running Company. Check out your LYS, too. I know that you can get three- or six-packs of standard, white sports socks just about anywhere. I highly encourage you to get the best quality socks you can get. This is probably one of the most important parts of building your running gear inventory. You will be pounding your feet into the ground repeatedly, in a variety of weather elements, and you want to take good care of them. Making the switch from average, general athletic type socks to socks specifically designed for running was one of the best things I ever did. I didn’t even know what I was missing until I experienced something different. 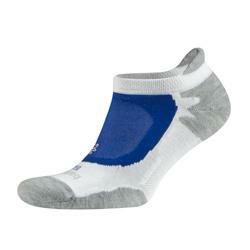 Running socks that breathe and provide cushion and support, without bulk, are something special. Oh, Balega, how do I love thee? Balega socks are the ones I trust the most to keep my feet happy. They provide a substantial amount of protection against the harshness of the pavement, while still remaining thin enough to wear comfortably with my Mizunos. They are my go-tos for all my long runs and my races. If I was to give a runner-up award in this category it would go to Experia with Thorlo. These are a bit bulkier than Balegas, but for street runners like myself, offer excellent cushioning. For so many years of my life, one of the reasons I thought I could never be a runner was because of my chest. Running is high-impact, no doubt about it, and depending on your body type, it can be downright painful to do without the right sports bra. No pull-over stretchy sports bra I ever tried from any department store or big-box sporting goods stores were ever effective for me. Most of them come in three sizes only – small, medium, and large. And, what if your cup size is large, but your band is small?! There are way more than three sizes of women out there! It’s downright infuriating. This is an area to really focus on. One good quality sports bra can turn you from aspiring runner to inspirational runner. It’s that important. Moving Comfort is incredible. When I discovered their bras, it was like a moment in a cheesy television show where harps are strummed, a choir sings, and the room is flooded with beautiful light. These bras fit all shapes and sizes of women’s bodies. They stay put. They last through multiple washings. And, they’re not even that expensive, really. They rock. Buy one. Quickly. Yes, I’m serious. Running seams so simple, I know. But, there’s a lot to it if you want to do it effectively and safely. There are hundreds of books out there about running. They cover running form, marathon running, increasing speed, maximizing your diet, preventing injury, and on and on and on. I’d also be willing to bet that once you start running, you’ll discover how much there is to learn about it. You’ll start to ask questions and wonder about ‘how to’s’ and ‘what if’s’. Pick up a beginner’s guide to running and read through it. Then, keep it on your bookshelf for reference as you advance in your skills. I wrote a post about this a while back. Check out my resources for new runners to learn, be inspired and connect. Bob Glover’s book was a great beginning book for me. It covers a lot of topics and was a quick, easy read. 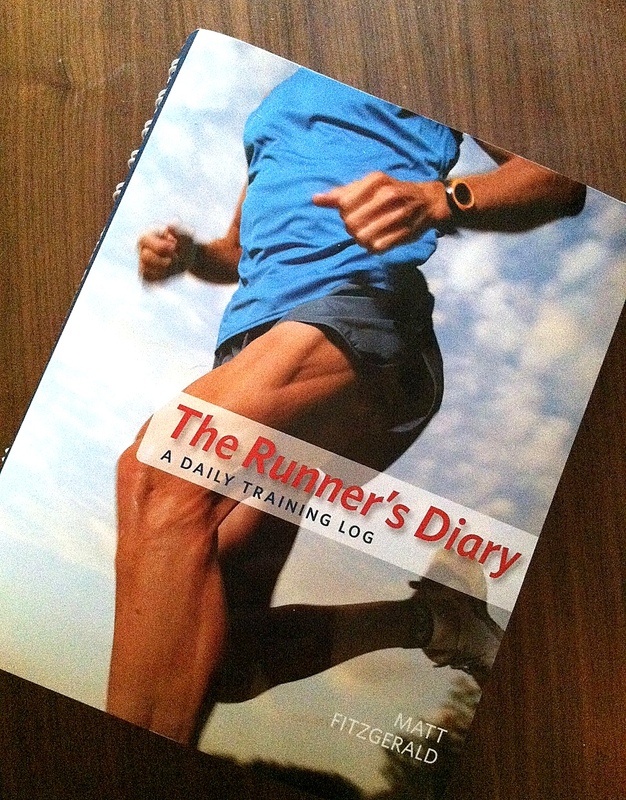 Some people feel that a training journal is only necessary once you are, you know, training – for a race or a specific goal. I beg to differ. Training journals are fantastic tools from the get-go. They give you a dedicated space to track your runs (and other workouts), times, aches and pains, overall performance, feelings, moods, and sometimes nutrition. Keeping an eye on this information from the beginning will help you learn how your body is reacting to your new routine. By periodically looking at this data, you can discover patterns that you have (it helped me learn that Mondays need to be rest days or light workout days for me – I am no good on a Monday run) and respond accordingly. You can track aches and pains which will help you notice and treat them early on – before they turn in to a sidelining injury. You can pay attention to how what you eat sits with you during a run and whether you run fresher in the morning, midday or evening. Essentially, a training journal is one of the most effective tools to helping you coach yourself. As a bonus, they’re fun to look back on to see what you’ve learned and how you’ve progressed along the way. There is a variety out there and most any of them would likely serve you well. Heck, you can even create your own with a basic notebook if you want. But, for what it’s worth, I like this one by Matt Fitzgerald (running guru). It has space for all the information that I deem to be important and extra room to write in random notes as needed. It’s spiral bound for easy flipping and bending and has little tips each week to expand your knowledge and motivation. There you go. The basics. As you progress, there are loads of other fun things to pick up (Sports Watches! Fuel Belts! Hydration Packs! Energy Chews! Headlamps!) and I’ll likely do a follow-up post about some of these items in the future. For now, take advantage of spring sales, weather, and energy to get the essentials that will get you started. I encourage you to look for local running stores in your area and get moving! I’ve done it! I have finally made a decision about my first marathon. Newport it will be! I am not a good decision maker. I agonize. I research and I plan and I debate with myself until I’m exhausted. Just when I think I’ve made a decision, I second guess myself and begin to pick it apart. Deciding on which marathon to select as my first was no different. There are so many factors to consider and I just wanted to make sure my decision was a good one. The right one. The best one possible. 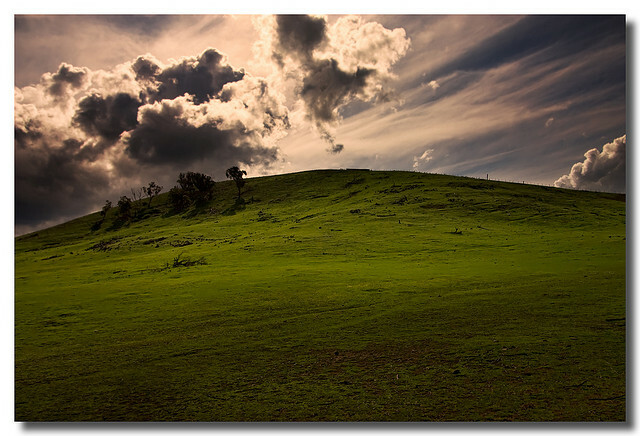 Location – I didn’t want to travel too far. Newport is only a couple hours by car. I can easily travel there the day before the race and have plenty of time to rest after arriving. 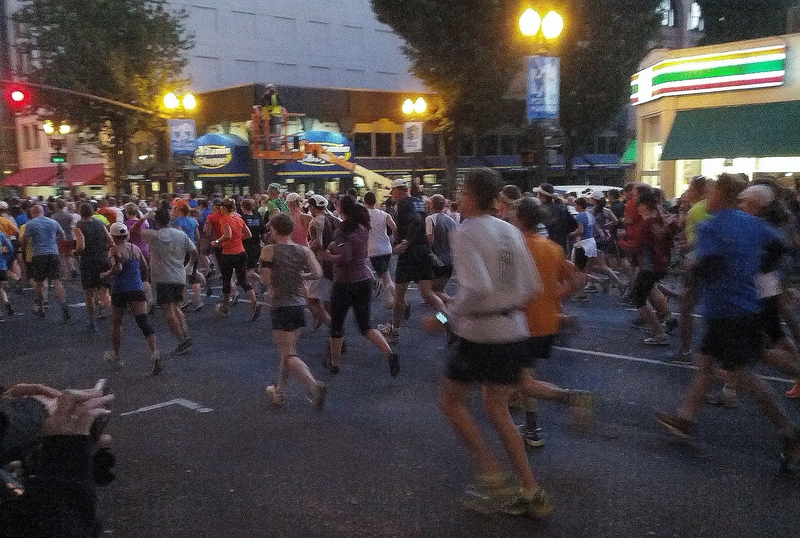 Timing – The idea of running the local Portland Marathon as my first was very tempting, but I just didn’t want to wait until October. While I still have training to do, I really don’t think I need quite that much time to prepare and the extra wait felt a bit painful to think about. 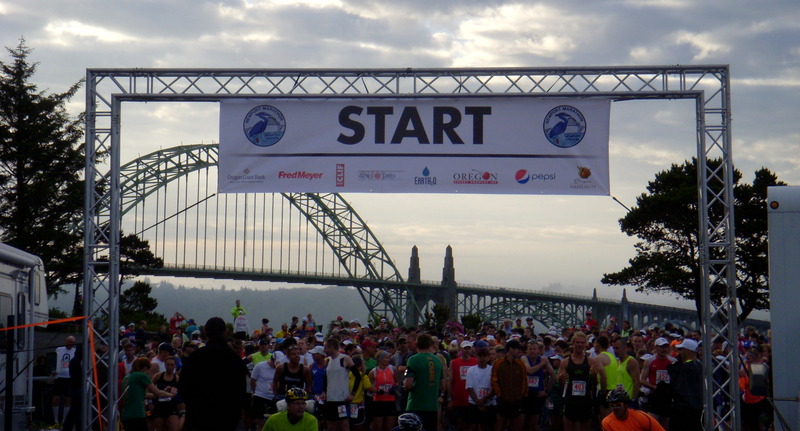 The Newport Marathon is a smaller event, capping out at 900 runners, but after much research I have found it to be generally well-reviewed by other runners. It has a pattern of being well-organized and is a mostly flat course. I think June will be ideal as far as weather is concerned and it’s not so small that I’ll feel too lonely (I hope). So, with just a bit under 5 months to go, the training plan is being finalized so I that I can stay focused through the rest of winter and spring. Having run a personal distance PR of 17.5 miles last weekend, I’m feeling good about being ready come June 1st. 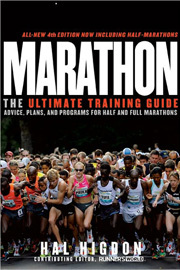 If any of you seasoned marathoners out there have any tips or advice, I gladly welcome them. I am both incredibly excited and somewhat terrified all at once – but that’s what conquering new personal challenges is all about, right?